Today's card is a CASE (Copy and Selectively Edit) of a card I made a little while ago. This time, I made the card from Basic Gray cardstock. I lightly dragged Frost White Shimmer Paint over the embossed trees with a paintbrush. 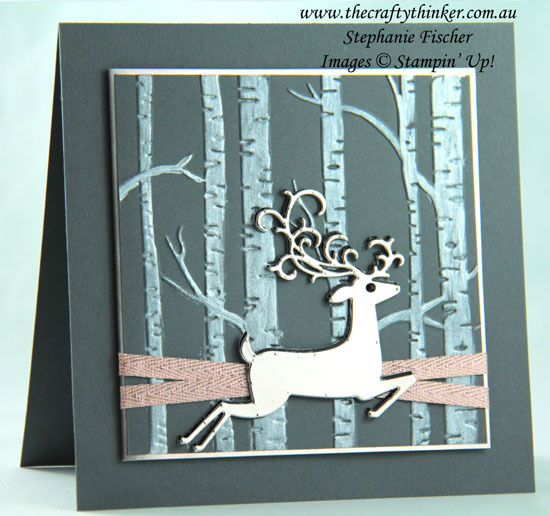 The top layer of the deer (there are three layers) is cut from Champagne Foil and I added a layer of Champagne Foil to the card to match. To better suit the gray and Champagne colouring, I used the Petal Pink Metallic Ribbon from the Combo Pack.